Almeo Research LLC. Research and Consulting. Finally, a disciplined, systematic approach to HHO technology. Almeo Research, LLC does third party verification of HHO technology for heavy Diesel vehicles. We have specialized methods and procedures designed specifically for validating the performance of HHO gas injection on Diesel engines (statistically equivalent to SAE J1321). Using this technology, we hope to accumulate data on hundreds of different kinds of vehicles and their respective applications. From this data, a knowledge base is being developed. Our specialized methods, procedures and knowledge base will enable us to specify HHO technology solutions that are optimal for the equipment and service requirements of your fleet. Click here for a product description. It is still under development but, you can click here to see an update. To see a video of a combustion analysis experiment we did on a single cylinder gas engine click here . Characterization of HHO gas. HHO is different from oxyhydrogen gas. 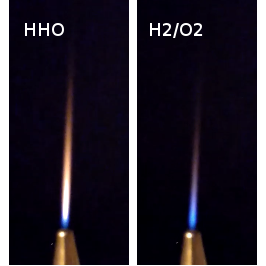 One method that can be used to characterize HHO is to burn it in a torch and note the appearance of the flame. On the right, the first photo compares the two flames on the same torch. But this is rather subjective. 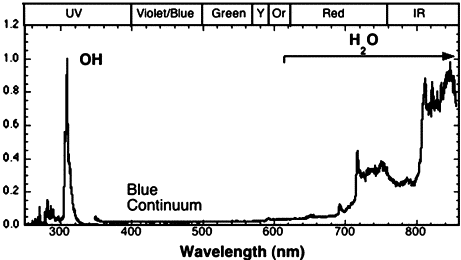 If the light from the torch is fed into a device called a spectrophotometer, a graph of intensity versus wavelength can be taken. The second photo shows a spectrograph of an oxyhydrogen flame. At present, we are putting together a spectrophotometry system. Even now, using a simple handheld spectroscope, it is possible to observe a peak at 600 nanometers on the HHO flame. No such peak exists on the oxyhydrogen flame. The spectrograph is a solid indication of the gas composition. Therefore, HHO is shown to be different from oxyhydrogen. We hope that correlation between spectrographic data and engine performance data will provide insight into management of the consistency issues. Please contact us. A lot more information is available to qualified contacts.